Swanton’s Averie Lutz, right, defends Braelyn Wymer of Delta during the Bulldogs’ first game this season. On Thursday, the Dogs got their first win when they defeated Ottawa Hills 37-25. 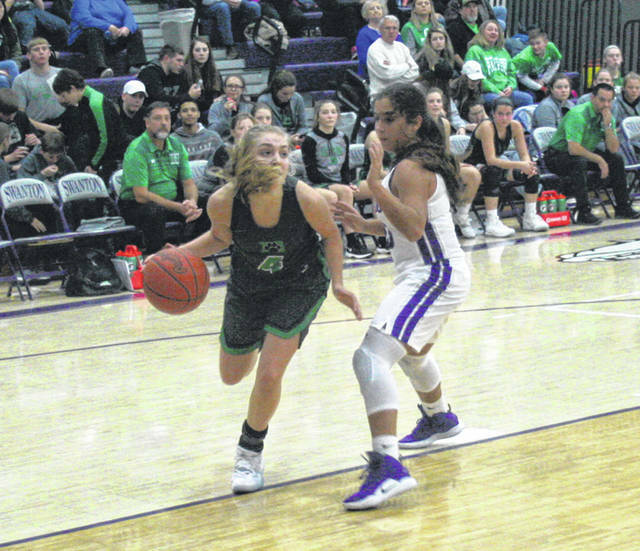 The three-point line was good to Swanton as the Bulldogs hit five from long range in the first half to take a nine point lead and go on to beat Ottawa Hills, 37-25, for the Bulldogs first victory of the year Thursday at home. Swanton moved to 1-2 on the young season after the win. After both teams misfired for the first five minutes, buckets from outside the arc by Grace Oakes and Averie Lutz helped the Bulldogs take a 6-2 lead with 2:07 left in the first. Another from Frankie Nelson early in the second, then two more courtesy of Kara Truckor and Oakes, the last with 2.6 ticks left in the half, gave Swanton a 19-10 halftime lead. Despite shooting just 7 for 29 in the first half, Swanton was the beneficiary of 13 Green Bear turnovers to boost their scoring chances. Bridget Harlett’s three-pointer and Oakes’ basket inside gave Swanton a 24-10 lead with 6:18 left in the third. Abbie Westmeyer and Catherine Byrne each got to the rim for Ottawa Hills to slice into the Swanton lead, but the Bulldogs answered on Ashlynn Waddell’s putback, an Aricka Lutz free throw, and Averie Lutz’ right side shot to take their biggest lead, 29-14. Again Ottawa Hills’ miscues were prominent as the Green bears committed 17 more in the second half and 30 for the game. Swanton was 14 for 51 from the floor with 18 turnovers. Ottawa Hills shot 9 for 35 from the field. No one from either team hit double figures. Last Tuesday, two late free throws lifted Lake past Swanton 48-46. After trailing 25-17 at the half, Swanton rebounded to tie the game at 39 after three quarters. Swanton is at Fayette Monday and returns home to face Evergreen in a non-league game Thursday.